Tucked away amongst the rugged and mysterious Superstition Mountains lies an unfathomable ancient stone wall shaped in a circular pattern. 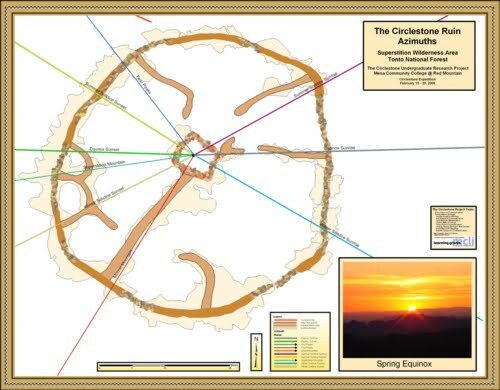 This profound structure has a pinwheel appearance labeled as an “Indian Medicine Wheel”, and can be found about 54 miles east of Phoenix. 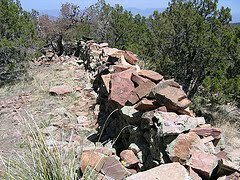 The wall is a remarkable 3 feet thick, relatively high and is seen in an uninterrupted circle that is estimated to be about 440 feet in length. The only entries are small access points scattered throughout the wall. The wall has a slight elliptical shape lending to the theory that it could be an ancient calendar or clock of some kind. Those who have studied it have noticed a possible sun alignment especially after the ruin was precisely mapped. The geographical placement of the Circlestone Ruin was built in an appealing locality deep in the Superstition Wilderness. From the location, mountain ranges can be seen 75 miles away such as the Superstition Mountains and Weavers needle to the west, the Sierra Anchas to the east, and the Mogollon Rim to the south. The Circlestone Ruin is not the only archeological circular wall uncovered in the region. Many of the trails leading into the Superstitions are thought to have been paths used by the early people. Another stone wall with the same circular pattern was located northwest of Circlestone Ruin and called, “Paridise Spring Overlook.” From the center of the circle, it measures about 70 meters and is twice as large as Circlestone. The walls were not as substantial or elevated which made it hard to clearly identify the site. Chris Allen, who founded the site, presumed it to be another site where rituals were preformed akin to Circlestone. The breathtaking view from the ruins is one to be seen but the ancient find is revered to be one of Arizona’s national treasures. It sounds like a very lovely place!